Finally I'm out in the open again. I hope the rest of Oregon is more like this and less like the first half. I have open views of the mountains; the Sisters, the Husband. I'm not sure whose husband the Husband is supposed to be. The Sisters look down along a good stretch of the PCT. I meander around the ridges that reach all the way to the tops of the peaks. For some reason it seems like the trail is climbing. Maybe I forget to notice when I'm going down, it just seems like I'm always going up. The forest is more open, more old growthy. Big trees with a trail beneath them. I catch views down into the meadows below. I'm up high just below where the trees completely thin out and the boulders and rocks that lead to the summits are. The dirt is multi-hued, browns, reds, and grays. I climb higher and higher as I head north past the Sisters over one ridge I catch a glimpse of Mt Washington, Three Fingered Jack, and Mt Jefferson to the north. This is exciting. It's fun hiking and seeing where I'm going. For the first time in over nineteen hundred miles a ranger wants to check my permit. Mile the friendly ranger is hanging out on the trail with a shovel. I suppose he uses the shovel when no ones looking. Maybe to put out forest fires, or to the maintain the trail. It's fun talking to him and getting the ranger perspective of us thru-hikers. I feel like he respects us and recognizes that if more people were as responsible as Thru-hikers the forest would be safer. Yay! I was beginning to think I've been carrying this paper for nothing, extra weight I don't need. It turns out I do need it. I hike on to the Obsidian Limited Entry Area. PCT Hikers are allowed entry without any madditional permit. There is a spring gushing ice cold water from the foot of the mountain. I sit here and have lunch. I drink two liters of cold water. I look at the Obsidian littering the place like so much broken glass. This is a special place I'm glad I'm here. A pack of equestrians come by just as I'm getting ready to leave. I give them a head start I don't want to be walking in their dust. I late them get ahead, but then they stop to talk to hikers coming the other way, so I slow down, not wanting to get in front of them. Finally they head off on a different trail and I'm free to travel as fast as I want. The trail heads up into a section of the mountain where lava used to come boiling out. Now it's just a solid river of rock pouring down the mountain. I head on into the lava and climb up the crater from whence it once came pouring forth liquid and hot. Now it's still hot from the suns rays, but not liquid. The lava is sharp and cobbly. It's a challenge to walk on. It's also rough on the outside of my shoes. My feet are getting tired and sore. Down the other side to another spring where I drink more cold water. I'm really getting used to the idea of drinking from springs the water is some much colder and cleaner than lakes or creeks. 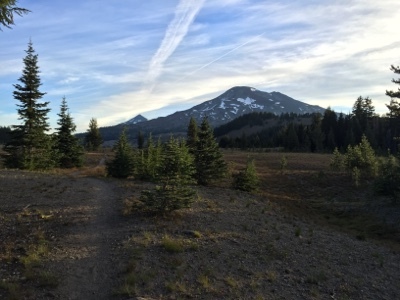 I hike to the beginning of the lava that spans across McKenzie Pass. I find a nice flat campsite in the trees. Dinner and chores before dark. I relax in my tent listening to the birds call to each other in the trees and the bees and flies buzzing around my tent. I seem to think I ditched the mosquitos gang for now. The sun sets on the other side of the lava, as it does it turns the clouds into flaming orange and pink decorations in the sky.